This particular branch of the family tree were Silversmiths. Klaas Jansen Heixan was born on August 11, 1678 in Dokkum, Friesland, and like his father also became a silversmith. Every silversmith in those days had his own sign, or seal, to mark his work. (I found his sign, the KH monogram, at Meestertekens van Friese goud- en zilversmeden, werkzaam in de periode van ca. 1700 tot 1812 (Masterseals from Friesian gold- and silversmiths that were working between 1700 to1812 – but this link is no longer active) Not only did I find his ‘signature’, a sign that he placed on every piece of silverware he created, I also found a picture of a piece he made. 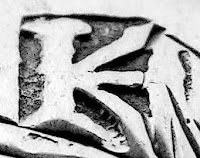 At the following site, Botma Genealogy I found the family crest of a family Botma, at the bottom of a seal, which is part of a pipe stamper and other helpful tools. The initials G.G.B, are that of the owner. Upon closer inspection you can see the silver mark of the maker. On this website you can read the following: “Gezien het zilvermerk is het werktuig gemaakt door de Dokkumer Klaas Heixan. Deze stond ingeschreven in het gildeboek van 1704 tot 1738′. 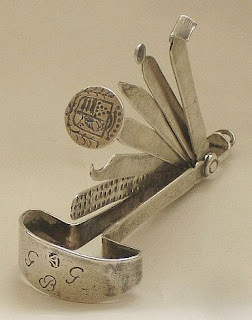 So, to think that one of my ancestors (even though it was long ago), created this piece from silver, somewhere in the 1700’s. It is like finding a little piece of my history. When looking for my ancestors, sometimes I rely on the research some others have done on that same branch. Just ‘google’ the name you are looking for and add a bit of information while you are surfing, like; ‘Heixan, Klaas ,silversmith ‘ that is how I found this picture and some more information to help me on my search. Do not forget to credit the site where you got your information. but to actually find a picture of something they created is even cooler. who married Dieuwke Klases Heixan in Dokkum on Jan 4th, 1739, was also a silversmith. He was born Feb. 25th, 1712 in Dokkum, and later worked from there. Below is an example of his work, a spoon created in abt. 1750. Klaas and Dieuwke had 5 children, son Joost (1744), who died before the of age 2, another son Joost (1746) who also died in infancy, a daughter Dirkje (1748), daughter Janke(1750) and another son Joost (Justus) in 1753, who was my 5th great-grandfather.